Wyburn-Mason syndrome (WMS), also known as Bonnet-Dechaume-Blanc syndrome or retinoencephalofacial angiomatosis, is a rare condition. It is considered one of the nonhereditary congenital phakomatoses and is characterized by arteriovenous malformations (AVMs) that affect the retina, visual pathways, midbrain, and facial structures. It usually is unilateral and often is asymptomatic. An example of a retinal AVM is shown in the image below. Dilated arteriovenous system representing a well-compensated unilateral retinal arteriovenous malformation. This 12-year-old girl had 20/20 vision and a negative systemic evaluation. Although these combined vascular abnormalities were recognized prior to the reports of Bonnet (1937)  and Wyburn-Mason (1943),  this syndrome is most frequently referred to as Wyburn-Mason syndrome, to honor the initial author of the classic case series. Wyburn-Mason syndrome is a congenital, nonhereditary, sporadic disorder and without sexual or racial predilection. Other vascular malformations may be present elsewhere in the body, including facial skin. In contrast to other phakomatoses, Wyburn-Mason syndrome does not commonly cause cutaneous manifestations. Wyburn-Mason syndrome is extremely uncommon, with incidence and prevalence rates that remain poorly defined. To date, fewer than 100 cases have been reported in the literature. The worldwide incidence of Wyburn-Mason syndrome is also rare but ill defined. Wyburn-Mason syndrome has no reported racial predilection, and there is no familial form of the syndrome. Wyburn-Mason syndrome is a congenital disorder. Larger retinal AVMs that cause visual or neurologic impairment are generally diagnosed earlier in life, whereas smaller AVMs may remain asymptomatic and may not be diagnosed until later in life. Bonnet P, Dechaume J, Blanc E. L'aneurysme cirsoide de la retine (aneurysme vasemeaux). J Med Lyon. 1937. 18:165-178. 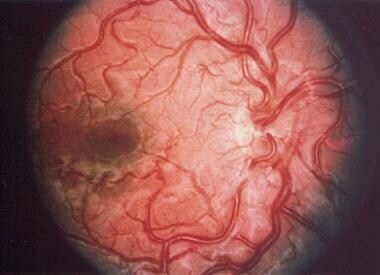 Wyburn-Mason R. Arteriovenous aneurysm of midbrain and retina, facial naevi and mental changes. Brain. 1943. 66:163-203. Ponce FA, Han PP, Spetzler RF, Canady A, Feiz-Erfan I. Associated arteriovenous malformation of the orbit and brain: a case of Wyburn-Mason syndrome without retinal involvement. Case report. J Neurosurg. 2001 Aug. 95(2):346-9. [Medline]. Liu A, Chen YW, Chang S, Liao YJ. Junctional visual field loss in a case of Wyburn-Mason syndrome. J Neuroophthalmol. 2012 Mar. 32(1):42-4. [Medline]. Schmidt D. [Congenital retinocephalic facial vascular malformation syndrome. Bonnet-Dechaume-Blanc syndrome or Wyburn-Mason syndrome]. Ophthalmologe. 2009 Jan. 106(1):61-8; quiz 69. [Medline]. Matsuo T, Yanai H, Sugiu K, Tominaga S, Kimata Y. Orbital exenteration after transarterial embolization in a patient with Wyburn-Mason syndrome: pathological findings. Jpn J Ophthalmol. 2008 Jul-Aug. 52(4):308-13. [Medline]. Medina FM, Maia OO Jr, Takahashi WY. Rhegmatogenous retinal detachment in Wyburn-Mason syndrome: case report. Arq Bras Oftalmol. 2010 Jan-Feb. 73(1):88-91. [Medline]. Cortnum SO, Sorensen P, Andresen J. Bilateral Wyburn-Mason syndrome presenting as acute subarachnoid haemorrhage - a very rare congenital neurocutaneous [corrected] disorder. Acta Neurochir (Wien). 2008 Jul. 150(7):725-7. [Medline]. Tlucek PS, Moreau A, Siatkowski RM, Repka MX. A twisted mess. Surv Ophthalmol. 2012 Jan-Feb. 57(1):77-82. [Medline]. Achrol AS, Guzman R, Varga M, Adler JR, Steinberg GK, Chang SD. Pathogenesis and radiobiology of brain arteriovenous malformations: implications for risk stratification in natural history and posttreatment course. Neurosurg Focus. 2009 May. 26(5):E9. [Medline]. Vucic D, Kalezic T, Kostic A, Stojkovic M, Risimic D, Stankovic B. Duane type I retraction syndrome associated with Wyburn-Mason syndrome. Ophthalmic Genet. 2012 Jun 14. [Medline]. Archer DB, Deutman A, Ernest JT, Krill AE. Arteriovenous communications of the retina. Am J Ophthalmol. 1973 Feb. 75(2):224-41. [Medline]. Theron J, Newton TH, Hoyt WF. Unilateral retinocephalic vascular malformations. Neuroradiology. 1974. 7(4):185-96. [Medline]. Bech K, Jensen OA. On the frequency of co-existing racemose haemangiomata of the retina and brain. Acta Psychiatr Scand. 1961. 36:47-56. [Medline]. Telander DG, Choi SS, Zawadzki RJ, Berger N, Keltner JL, Werner JS. Microstructural Abnormalities Revealed by High Resolution Imaging Systems in Central Macular Arteriovenous Malformation. Ophthalmic Surg Lasers Imaging. 2010 Mar 9. 1-4. [Medline]. [Full Text]. Turell ME, Singh AD. Vascular tumors of the retina and choroid: diagnosis and treatment. Middle East Afr J Ophthalmol. 2010 Jul. 17(3):191-200. [Medline]. [Full Text]. Rizzo R, Pavone L, Pero G, Chiaromonte I, Curatolo P. A neurocutaneous disorder with a severe course: Wyburn-Mason's syndrome. J Child Neurol. 2004 Nov. 19(11):908-11. [Medline]. Ruggieri M, Konez O, Di Rocco C. Neurocutaneous Disorders Phakomatoses and Hamartoneoplastic Syndromes. New York, NY: Springer; 2008. 345--52. Shah GK, Shields JA, Lanning RC. Branch retinal vein obstruction secondary to retinal arteriovenous communication. Am J Ophthalmol. 1998 Sep. 126(3):446-8. [Medline]. Effron L, Zakov ZN, Tomsak RL. Neovascular glaucoma as a complication of the Wyburn-Mason syndrome. J Clin Neuroophthalmol. 1985 Jun. 5(2):95-8. [Medline]. Callahan AB, Skondra D, Krzystolik M, Yonekawa Y, Eliott D. Wyburn-Mason Syndrome Associated With Cutaneous Reactive Angiomatosis and Central Retinal Vein Occlusion. Ophthalmic Surg Lasers Imaging Retina. 2015 Jul-Aug. 46 (7):760-2. [Medline]. Rao P, Thomas BJ, Yonekawa Y, Robinson J, Capone A Jr. Peripheral Retinal Ischemia, Neovascularization, and Choroidal Infarction in Wyburn-Mason Syndrome. JAMA Ophthalmol. 2015 Jul. 133 (7):852-4. [Medline]. Panagiotidis D, Karagiannis D, Tsoumpris I. Spontaneous development of macular ischemia in a case of racemose hemangioma. Clin Ophthalmol. 2011. 5:931-2. [Medline]. [Full Text]. Bloom PA, Laidlaw A, Easty DL. Spontaneous development of retinal ischaemia and rubeosis in eyes with retinal racemose angioma. Br J Ophthalmol. 1993 Feb. 77(2):124-5. [Medline]. [Full Text]. Brodsky MC, Hoyt WF. Spontaneous involution of retinal and intracranial arteriovenous malformation in Bonnet-Dechaume-Blanc syndrome. Br J Ophthalmol. 2002 Mar. 86(3):360-1. [Medline]. [Full Text]. Hartmann A, Mast H, Choi JH, Stapf C, Mohr JP. Treatment of arteriovenous malformations of the brain. Curr Neurol Neurosci Rep. 2007 Jan. 7(1):28-34. [Medline]. Lunsford LD, Kondziolka D, Flickinger JC, Bissonette DJ, Jungreis CA, Maitz AH, et al. Stereotactic radiosurgery for arteriovenous malformations of the brain. J Neurosurg. 1991 Oct. 75(4):512-24. [Medline]. Morgan MK, Johnston IH, de Silva M. Treatment of ophthalmofacial-hypothalamic arteriovenous malformation (Bonnet-Dechaume-Blanc syndrome). Case report. J Neurosurg. 1985 Nov. 63(5):794-6. [Medline]. Pan DH, Guo WY, Chung WY, Shiau CY, Chang YC, Wang LW. Gamma knife radiosurgery as a single treatment modality for large cerebral arteriovenous malformations. J Neurosurg. 2000 Dec. 93 Suppl 3:113-9. [Medline]. Pollock BE, Gorman DA, Coffey RJ. Patient outcomes after arteriovenous malformation radiosurgical management: results based on a 5- to 14-year follow-up study. Neurosurgery. 2003 Jun. 52(6):1291-6; discussion 1296-7. [Medline]. Schmidt D, Pache M, Schumacher M. The congenital unilateral retinocephalic vascular malformation syndrome (bonnet-dechaume-blanc syndrome or wyburn-mason syndrome): review of the literature. Surv Ophthalmol. 2008 May-Jun. 53(3):227-49. [Medline]. Wilkins RH. Natural history of intracranial vascular malformations: a review. Neurosurgery. 1985 Mar. 16(3):421-30. [Medline].